If you are a fan of Julie Kenner, JK Beck, Nina Bang, Jax Cassidy, and Terri Reid or even HP Mallory, you will love this paranormal romance action series. I can't wait to read the next in the series and continue on until I reach the ARC book I'm supposed to read. I forgot how much I enjoyed this series and don't want to miss out on anything by skipping a book in the Demonslayer series. 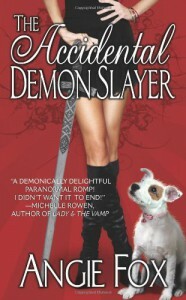 Angie Fox, thanks for bringing me back to this genre.